Jennifer McClure specializes in the trial of eminent domain and inverse condemnation matters, including pre-condemnation delay and loss of business goodwill. She has represented a variety of corporations, landowners, and public agencies in real estate valuation law and environmental disputes. 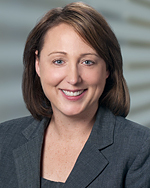 Her litigation experience includes representation of developers in variety of construction defect litigations and national insurers in numerous environmental coverage actions. City of La Puente Redevelopment Agency v. Gudzunas, et al. – Representation of the owner of a three acre retail shopping mall developed in the 1950s. The condemning agency, the City of La Puente Redevelopment Agency, initially offered $3.55 million. Our team negotiated a lost rent agreement which insulated our client from any loss of income during the litigation. The case then settled on the eve of jury trial for total compensation of $6.2 million to our client. Caltrans vs. Calvary Deaf Church and the Southern California Assemblies of God – Represented defendant congregation and denomination concluding in a $4.6 million settlement, just one week before a scheduled three week jury trial. Caltrans had previously offered no more than $1.6 million and had planned to argue at trial for a $770,000 value. The final settlement is well more than five times this figure. People of the State of California, by and through the Department of Transportation v. Canyon Springs LLC (Riverside County Superior Court) – Represented landowner Canyon Springs LLC. Caltrans offered $1.1 million for 3.79 acres of land near the 1-215/State Route 60 interchange. The case settled one week before trial for $3.8 million. Inland Valley Development Agency vs. JAKS, LLC – Represented JAKS, a shopping center developer, in a condemnation matter over a l0-acre parcel of land located along the 1-10 expressway in San Bernardino. The Agency condemned the property in order to convey it to another developer who built a Sam’s Club. The Agency believed the property was worth $1.9 million due to access issues. The case settled one-week before trial for $3.45 million. Paramount Unified School District v. McLane Manufacturing, Inc., et al. (Los Angeles Superior Court (Central)) – Represented manufacturer of high-end lawn mowers and the largest employer in the City of Paramount in a condemnation matter. Settled case for $5.58 million, which is more than twice what the school district had originally offered. Santa Ana Unified School District v. Bouchier, et al. (Orange County Superior Court) – Represented the Bouchier family in connection with the taking of an 8.3 acre parcel of land, which will be the future site of an elementary school. The case settled for $6.2 million. Garden Grove Agency for Community Redevelopment v. Hong, et al. (Orange County Superior Court) – Represented auto broker and dealer. The Agency’s pre-litigation offer was $16,000. The Agency paid client $950,000 to resolve the case, two weeks before jury trial. Garden Grove Agency for Community Development v. Nguyen (Orange County Superior Court) – Representation of business owner facing condemnation and substantial business goodwill losses. People of the State of California, by and through the Department of Transportation v. Jack Wade and Cowboy Boogie (Orange County Superior Court) – Representation of business owner facing condemnation. Lippert v. People of the State of California, by and through the Department or Transportation(Fresno County Superior Court) – Representation of landowner in inverse condemnation action. Beard v. Motel 6 (Orange County Superior Court) – Representation of lessee in arbitration of ground lease valuation. City of Los Angeles – Los Angeles World Airports. Special counsel to the City Attorney on condemnation and eminent domain related real property issues at the Airports. This ongoing work includes issues not only at LAX, but Ontario and Palmdale Airports. Riverside County Flood Control and Water Conservation District – Counsel to the District on condemnation and eminent domain related issues. This ongoing work includes condemnation matters involving over 30 parcels of property necessary for expansion of flood control facilities. South Coast Water District – Represent the District in quiet title action involving inverse condemnation claims for a 20-acre parcel of property along the San Juan Creek in Dana Point. Los Angeles Unified School District – Member of team assisting LAUSD with acquisition, precondemnation, and condemnation activities for its massive school expansion project. Responsible for condemnation actions, including the timely obtaining of orders of immediate possession needed by LAUSD to secure project funding. Alameda Corridor Transportation Authority – Member of team responsible for condemnation actions required for the Alameda Corridor, a 20-mile rail corridor from the Ports of Los Angeles and Long Beach to the rail yards in downtown Los Angeles and East Los Angeles. The condemnation matters involved both industrial and commercial property and claims for compensation, severance damages, loss of goodwill and related relocation claims. Chevron Land Development Co. and Mission Viejo Company (Shea Homes) – Representation of developers in a variety of construction defect matters. Orange County Bar Association – Business Litigation Section and Real Estate Section. 2005 and 2006: Southern California Super Lawyers “Rising Star”, General Litigation, Los Angeles Magazine. Speaker, “Ethical Considerations For The Eminent Domain Practitioner,” CLE International Eminent Domain Conference, San Diego, CA (March 26, 2015). Speaker, “To Be Ethical (Or Not To Be) – – That Is The Question,” CLE International Eminent Domain Conference, San Diego, CA (May 15, 2014). Speaker, “Legal Advocacy For and Against Public Agencies – Same and Different Rules,” IRWA Chapter 1 (October 22, 2013). Speaker, “Multi-Parcel Acquisition Programs: Three Ways Engineers, ROW Professionals and Attorneys Can Work together To Achieve A Smooth – and Faster – Acquisition,” IRWA Chapter 1, Los Angeles, CA (May 17, 2011). Speaker, “From Resolution of Necessity to Order of Possession,” CLE 10th Annual Conference, Los Angeles, CA (May 10, 2005).